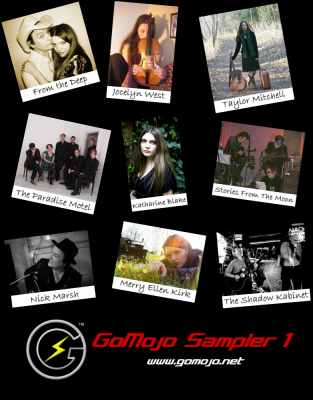 A free compilation of music from some of the exceptional artists who have sold their music through GoMojo. Track listing (all are full tracks): Katharine Blake: Midnight Flower. Merry Ellen Kirk: Masquerade. Nick Marsh: Destiny Angel. The Shadow Kabinet: Nostalgia For The Future. Jocelyn West: Salt Bird. The Paradise Motel: Shipped As Ballast. From the Deep: Where Blue Shadows Grow. Taylor Mitchell: Fun While It Lasted. Stories From The Moon: Martyrdom of the Chaos Whore Virgin. Released in 2012 and includes the original digital booklet. Please buy the full albums to support the artists.